GCET Application Form (गोवा सीईटी आवेदन फॉर्म) 2017: The Directorate of Technical Education, Goa has released an official notification. As per this notification, the candidates who are interested in participating in Goa Common Entrance Exam 2017 for ADMISSIONS TO FIRST YEAR OF PROFESSIONAL DEGREE COURSES are informed that they have to register for GCET and for it, they have to submit the Application form “A” and “B”. At the time of registration, they have to download the Goa CET Application Form “A” and then have to submit it to the postal address mentioned below between the dates 03rd April to 08th April 2017. Form “B”, “B1”, “B2” are needed to be submitted by the selected candidates after the declaration of the result, at the time of admission between 18th to 26th May 2017. All the candidates applying for the Goa CET must make it sure that their GCET Application Form 2017 should need to be reached the given address on or before the last date, applications received after the last date will not be received. The entrance exam will be conducted on 09th May for Physics, Chemistry and for Maths it will be conducted on 10th May 2017. 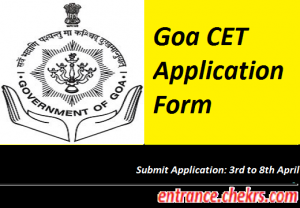 Candidates who want to participate in the Goa CET 2017, they have to meet the eligibility criteria in all the aspects and then they will have to submit their duly filled GCET Application Form 2017 to the address given here. The dates in which the applications will be accepted are 03rd April to 08th April 2017. The applications received after the application submission deadline will not be accepted, so make it sure that the completely filled Goa Common Entrance Test Form 2017 have reached the respective postal address. We have discussed the steps below by following those, the candidates will be able to apply for the Goa common entrance exam easily. Candidates have to visit the official website of DTE Goa, i.e. dtegoa.gov.in/. Attach the copies of all the necessary documents with the application form. Pay the application fees of Rs. 1500/- via demand draft or by payment mode. Submit the application form to the respective address as shown below. Academic Qualification: Candidates should have passed their 10+2 standard with minimum 45% marks for General and 40% marks for reserved categories. For Dentistry, Medicine, Homoeopathy, Nursing, Allied Health Science courses, candidates should need to achieve minimum 17 years of age as on 31st December pof each respective year. No age criteria for Pharmacy, Engineering and Architecture programs. Aspirants who applying for application form they can refer this exam dates while applying for admission process. Following are the GCET 2017 Exam Dates which is showing down. Candidates need to pay Rs. 1500 via Demand Draft at the time of application submission. Directorate of Technical Education, Porvorim. An applicant for Degree courses in Medicine, Engineering, Dentistry, Pharmacy, Ayurveda, Homoeopathy, Allied Health Sciences and Nursing should need to be appeared and have scored qualifying marks in the Goa CET, that is conducted by DTE Goa for the respective year. Previous year score will not be considered, this entrance exam is conducted each year. The minimum qualifying marks for Medicine and Dentistry Degree courses are reserved i.e. 50% (SC/ST/OBC: 40% and PWD: 45%) aggregate in specified subjects. For other courses, a cutoff will be declared as per the marks obtained and no. of applied candidates. An applicant for B.Arch will be selected as per their score in NATA of the respective year, that is conducted by the Council of Architecture. The Directorate of Technical Education, Goa conducts the Goa Common Entrance Test, each year for enrolling the eligible candidates in various engineering colleges that come under the control of DTE Goa. Only the eligible applicant are invited to apply for Goa Common Entrance Test. The applicants have to collect the Goa CET Application Form 2017 from the designated centers at Goa. And then they have to submit it to the given address between the dates 03rd April to 08th April 2017. Candidates should make it sure that their applications have received at the receiver end till the last date, as the applications received after the last date will not be accepted. For any type of assistance, while applying for Goa Common Entrance Test Registration Form 2017, you can contact us by leaving your comments at the end of the post.